David R. Malpass previously served as Under Secretary of the Treasury for International Affairs for the United States. 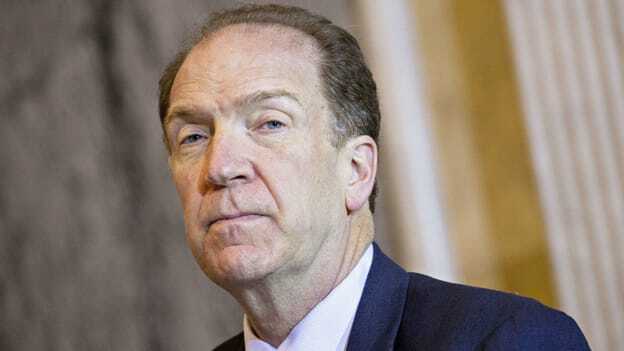 The Executive Directors of the World Bank unanimously selected David R. Malpass as President of the World Bank Group for a five-year term beginning on Tuesday, April 9, 2019. The Board expressed its deep gratitude to Interim President Kristalina Georgieva for her dedication and leadership in recent months. Malpass previously served as Under Secretary of the Treasury for International Affairs for the United States. As Under Secretary, Malpass represented the United States in international settings, including the G-7 and G-20 Deputy Finance Ministerial, World Bank-IMF Spring and Annual Meetings, and meetings of the Financial Stability Board, the Organization for Economic Cooperation and Development, and the Overseas Private Investment Corporation. Prior to becoming Under Secretary, Malpass was an international economist and founder of a macroeconomics research firm based in New York City. Earlier in his career, Malpass served as the U.S. Deputy Assistant Secretary of the Treasury for Developing Nations and Deputy Assistant Secretary of State for Latin American Economic Affairs. In these roles, he focused on an array of economic, budget, and foreign policy issues, such as the United States’ involvement in multilateral institutions, including the World Bank. Malpass has served on the boards of the Council of the Americas, Economic Club of New York, and the National Committee on US-China Relations. Malpass earned his bachelor’s degree from Colorado College and his MBA from the University of Denver. He undertook advanced graduate work in international economics at the School of Foreign Service at Georgetown University.